Details Victoria green is a complex calcium chromium silicate based on chromium oxide, fluorspar, quartz and other minor substances. The pale green color is permanent and light fast. The origin of this pigment is obscure. The potter Sir William Burton introduced the pigment to the Society of Mural Decorator and Painters in Tempera in about 1900. The Society of Tempera Painters named the ceramic pigment Vernalis. Victoria green was the name designating a calcium chromium silicate pigment developed for use in ceramics. The name was also used by artists' paint manufacturers to designate a mixture of 80 parts of Viridian (PG 18), 40 parts of zinc yellow, and 10 parts of barytes, gypsum, lithopone or zinc oxide (PW 4). Victoria green was sometimes called permanent green. The Colour Index lists a green oxalate dye as Basic Green 4 (42000). 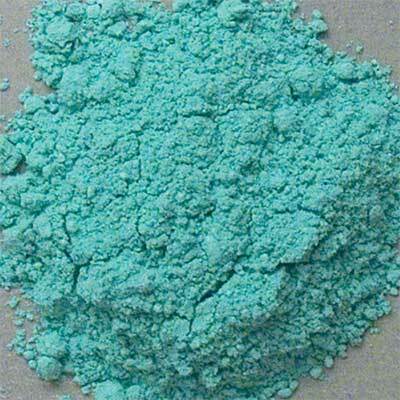 Victoria green is an artificial pigment made by heating chromium dioxide, quartz and chalk (calcium carbonate). 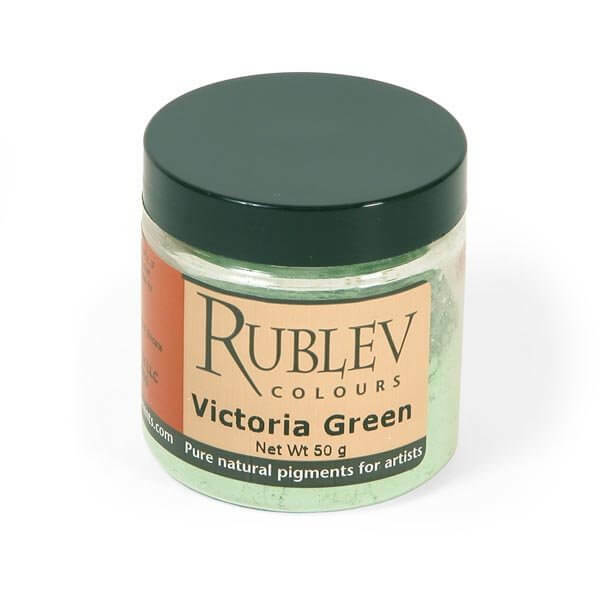 Rublev Victoria green is made according to the original recipe for the ceramic pigment. Victoria green is light fast and permanent. It is compatible with all pigments and with all vehicles including fresco. Victoria green absorbs a medium amount of oil (25 g oil per 100 g of pigment). Victoria green is not considered to be toxic, however, care should be used in handling the dry powder pigment to avoid breathing the dust.